Although Nokia have been going through a rather difficult spell in recent years, they have still been managing to cling on to the top spot when it comes to global sales of cellphones – until now. According to new research conducted by a number of analytics firms, Samsung have ousted Nokia from the top of the leader board. The reports, conducted by IHS iSuppli and Strategy Analytics show that the Finnish handset maker has been unable to cling for dear life on the top spot and has finally been knocked from the perch by Samsung due to Nokia’s poor sales performances of recent times. 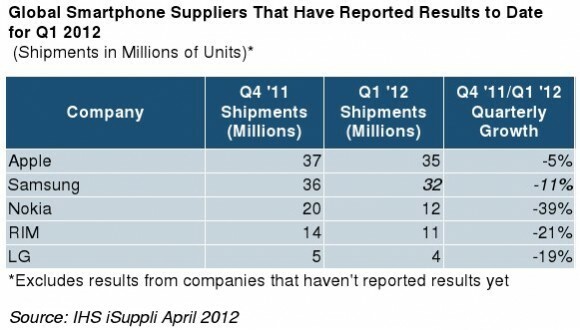 In the first quarter of 2012, Nokia’s market share dropped down to a low of 22.5% while Samsung raced into the lead by holding a 25.4% of the global mobile market. In the same period, Apple were sitting with a 9.5% hold, which may not seem like a great deal but considering the company only produces the iPhone, this is quite some achievement. Nokia’s volumes were squeezed at both ends, as low-end feature phone shipments in emerging markets stalled and high-end Microsoft Lumia smartphones were unable to offset the rapid decline of Nokia’s legacy Symbian business. Nokia was the world’s largest handset vendor between 1998 and 2011, for 14 years, before finally yielding top position to rival Samsung this quarter. 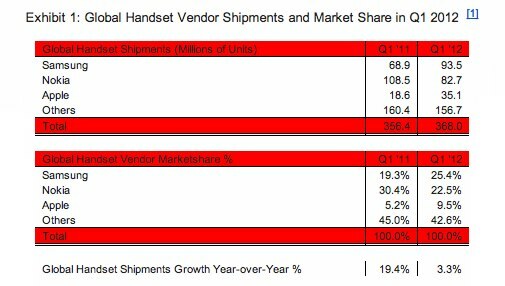 Although the statistics refer to sales of all mobile phones, the main focus of the market is currently centered around top-end smartphones, sales of which suffered in the first quarter of 2012 across all major manufacturers. As the table below from IHS shows, Apple suffered a 5% decline is sales with Samsung experiencing a change of 11% during the same period. Nokia’s woes continued as their shipments of smartphones dropped by eight million units in the first quarter. We have been used to seeing extraordinary boom in this market, but at the minute consumers are showing a reluctance in the marketplace with overall handset sales growing by a relatively small 3.3%. One of the firms involved in the research predicts that smartphone sales will be the only ones to increase in the next twelve months, growing by an estimated 35% while sales of standard handsets will decline.